I primarily DJ weddings in Orange County and in Los Angeles. On days that I don't DJ indie weddings, I DJ at lounges and clubs. 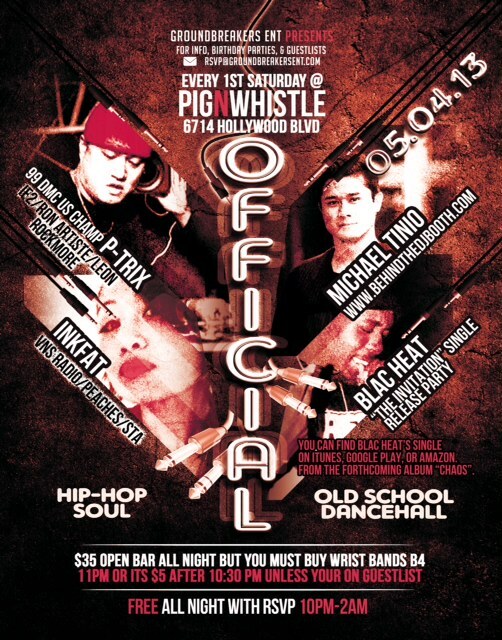 On May 4th, 2013, I had the pleasure of DJing at Pig N Whistle, in Hollywood, California alongside P-Trix and Inkfat. "Official" happens every first Saturday of the month. If you want to hear the world class skills of P-Trix or be entertained by dj/promoter/wonder woman, Inkfat - be there on the first Saturday of the month. Here is the event flyer.